Allows the user to easily position himself in a resting position. The Charme shell chair is the result of design, comfort and aesthetics for people with a weakened muscle tone. 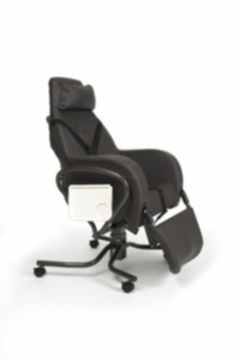 The chair allows the user to easily position himself in a resting position and keep his autonomy. It integrates in the patients home due to its looks and design and adds a therapeutic value. Coordinated tilt of seat and legrest for the perfect positioning without complicated adjustments. It is equipped with ergonomically shaped legrests for comfort (automatic extension). The seat height is adjustable in 2 positions. Two options for seat height. 4 swivel casters for easy movement. Colours and textiles: Khaki/beige fabric, red/grey fabric, blue/ecru fabric, skai taupe/brown fabric. Also available in manual version.